It’s almost always Vietnamese food–I’m always craving a bahn mi, or a steaming bowl of pho tai. 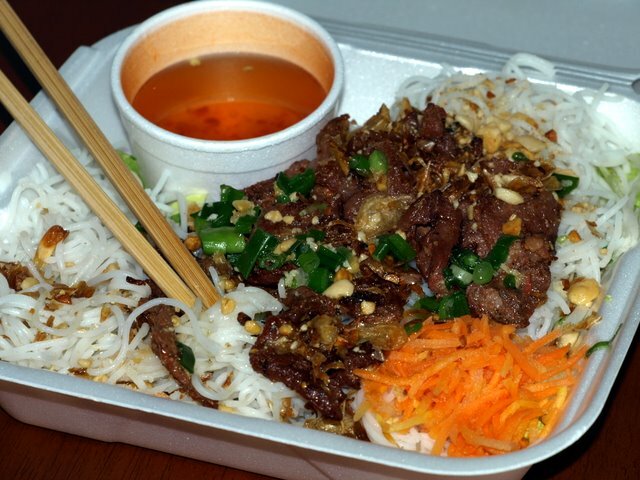 This week’s fix was takeout bun thit nuong from Pho Tau Bay (113 Westbank Expressway, Gretna, LA). Who needs sugarplums? In my dreams, a Vietnamese-Indian family opens a cafe in the defunct convenience store three blocks from my house. My dreams are filled with bo 7 mon, bun bo hue, chole masala and keema paratha.